There is very little snow left on the ground here in Toronto. 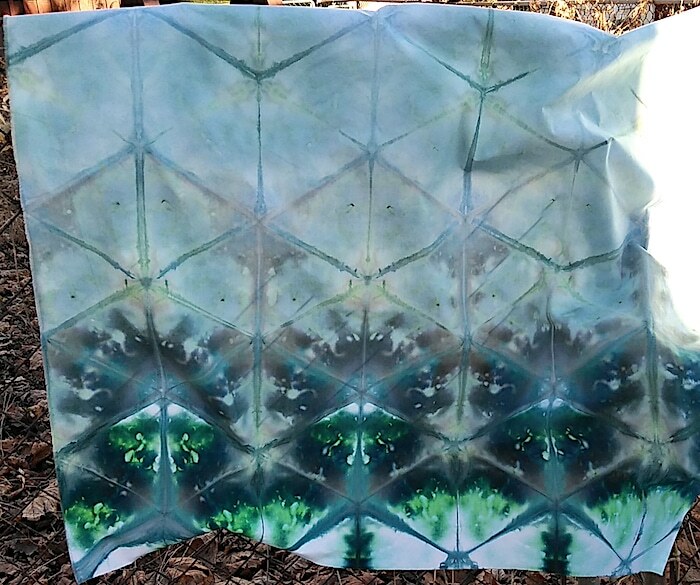 I wanted to do some more snow dyeing, so I quickly prepared a couple of pieces of pfd cotton before all the snow melted. 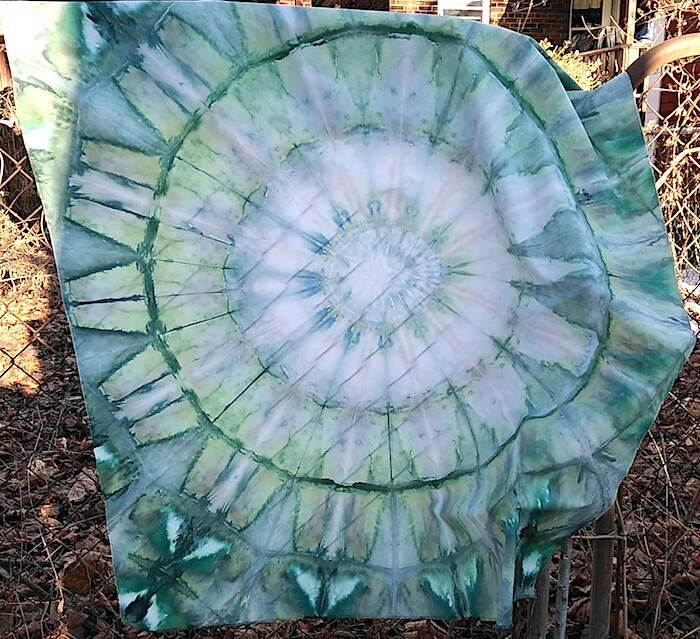 I folded one of the pieces of cotton so it would result in a mandala shape. The other was folded into a triangular shape. The mandala that emerged is beautiful. I sprinkled the snow topped cotton with a couple of blue dyes and a bit of yellow. 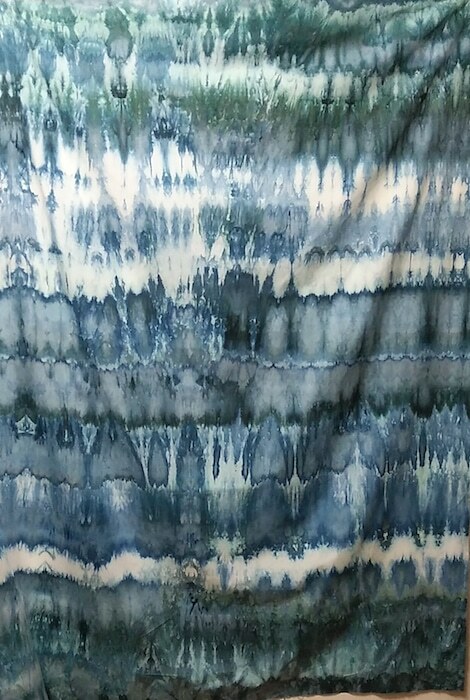 I am not a methodical, scientific dyer, so each dyeing session is an experiment. 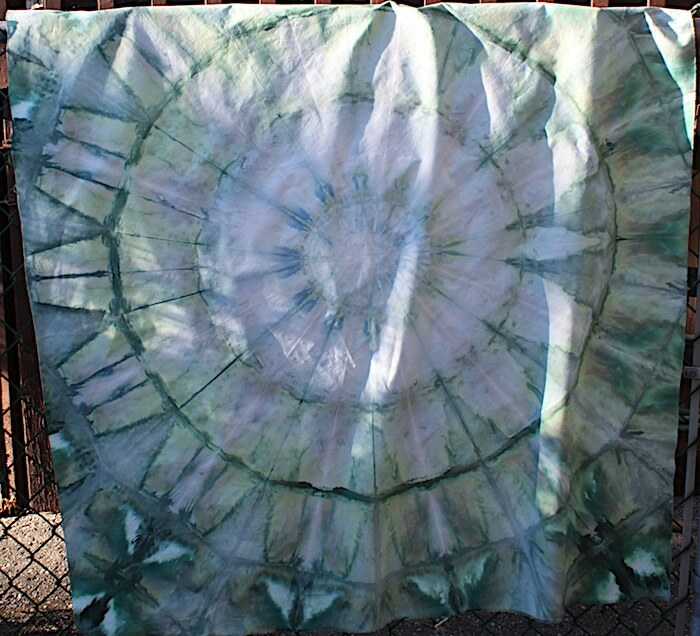 The triangular folded cotton is similar in colour, so I could use it in conjunction with the mandala. I really like how the colours are most intense on one edge, fading to a softer more watercolour effect. Since there was still one tiny pocket of snow left in the yard, I pulled out the last few metres of pfd cotton from my stash. There was just enough snow to cover the two pieces of cotton. I used the same colours of dye in different proportions. The fabric was also arranged differently from the first batch. 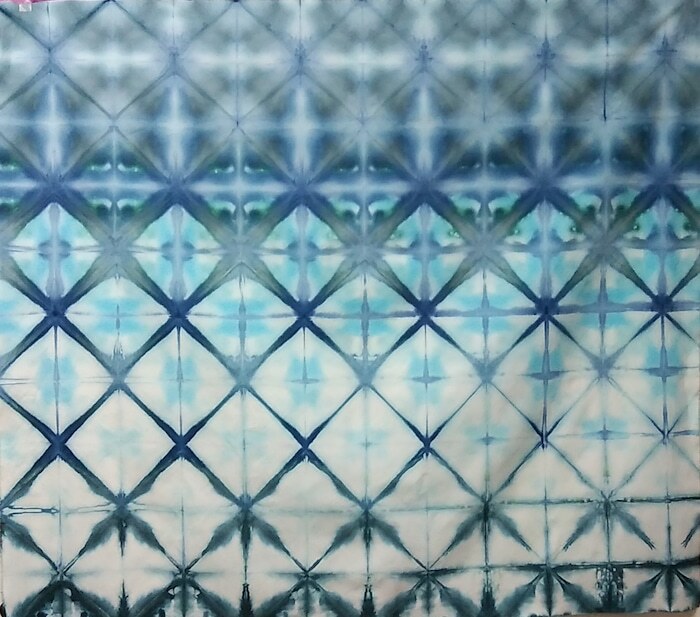 The piece above is 1 1/2 metres long and the pattern that reminds me of agate. 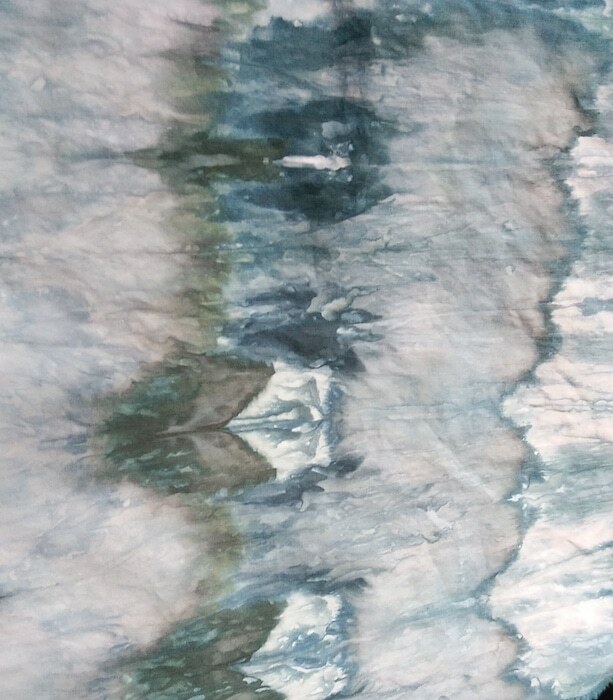 The photo below is a detail from the piece. 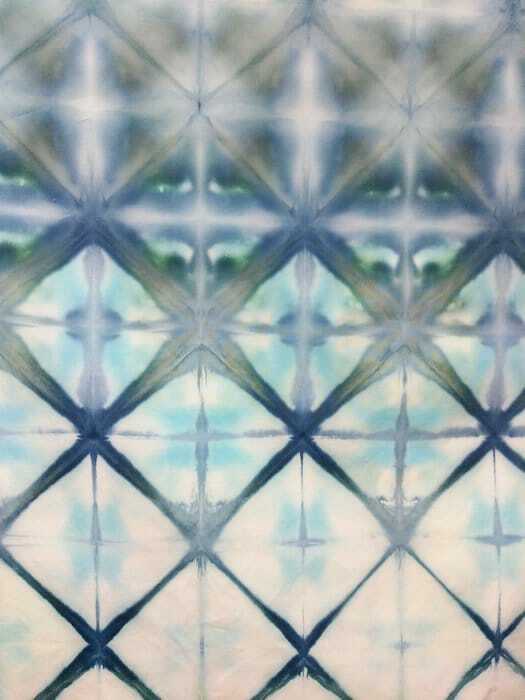 The itajime shibori cotton piece below is from the same snow dyed batch. It is quite different in design and the pfd cotton has absorbed a little more of the yellow to create a beautiful turquoise and green. I expect that we will not be receiving sufficient snow fall now that we are heading into spring. I do have a couple of other options I am considering to continue ‘snow’ dyeing all year-long. Now I just have to buy some more fabric to do just that!